When 13th Moon falls on a Friday (a day ruled by Venus whose overlord is Lakshmi, Goddess of Wealth) it is called as Aishwarya Pradosham. The Pradosham on a Friday is an opportunity to change your financial destiny. Vedic texts say that 13th Moon Pradosham helps to clear negative vibrations and bring progressive change in your life. Your negative mental projections are the unfolding of your past bad karmas which until forced out of your mind will keep blocking positive energies being absorbed. 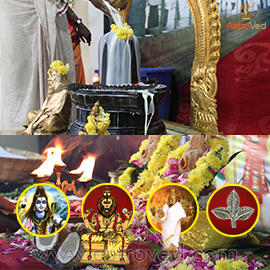 Why should you participate in Pradosham Ceremonies? The special Hydration ceremony to the Shiva Lingam performed during this special time window helps to dissolve your negative karma. Being in meditative mode and chanting the powerful mantra “ThiruNeelaKantam” during Pradosham time helps you in the karma dissolving process as this quantum sound frequency invokes the energies of Shiva, in the form of a blue light. The mantra literally means ‘Blue-throated One’ referring to the legend of Siva drinking the poison and his throat becoming blue. 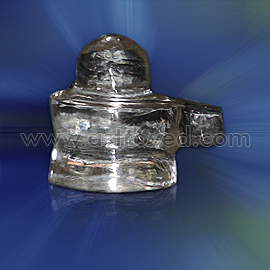 The medium-sized crystal Shiva Lingam will be energized in the Aishwarya Pradosham ceremonies. Lord Shiva is conceived in his unborn, invisible form as the Shiva Lingam. The Lingam represents the male creative energy of Shiva, or cause, and is worshipped as the Supreme Consciousness or Highest Intelligence. Hydration Ceremony to the Shiva Lingam performed at the special time window helps dissolve your karma. You will receive the energized medium sized crystal Shiva Lingam along with the sacred grey ash powder which will be blessed in the ceremonies. Keep this on your meditation altar and wear it on your forehead during meditation or at other times to expand the Divine blessings into your life. Please Note:Your Prasad will be shipped one week after the entire set of ceremonies is performed from Chennai, Tamil Nadu. For international shipping, please allow 2 – 4 weeks for delivery. 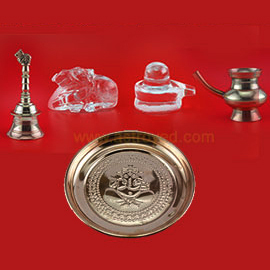 You will receive the energized Pradosham Pooja Kit along with the sacred grey ash powder which will be blessed in the ceremonies. Keep this on your meditation altar and wear it on your forehead during meditation or at other times to expand the Divine blessings into your life. Participate in the essential ceremonies for Aishwarya Pradosham. Shiva is the archetype who destroys the negativity that limits growth and success. Pradosham, the 13th Moon, is the most powerful time to receive his blessings., our Vedic specialists will perform special hydration ritual to call upon the energies of Shiva, and will perform a Light and Sound Ceremony that will help absorb your negative karma. You will receive the sacred grey ash powder which will be blessed in the ceremonies. Keep this on your meditation altar and wear it on your forehead during meditation or at other times to expand the Divine blessings into your life. Please Note: Your Prasad will be shipped from Chennai, Tamil Nadu. Please allow 2 – 4 weeks for delivery after the entire set of ceremonies is performed. Participate in the enhanced Pradosham ceremonies. 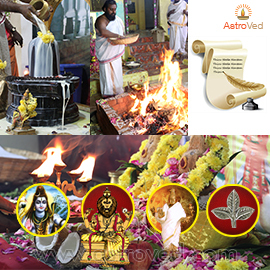 As per Vedas, Fire Lab is the most evolved spiritual technique to invoke divine energies for speedy results. 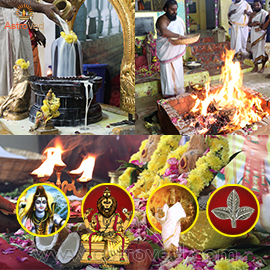 A group Fire Lab to Lord Shiva will be performed on Pradosham day helps remove your negative karma. Special Archana to Venus will also be performed on as the planetary placements are favorable on this day. Also our Vedic specialists will perform a hydration ritual to call upon the energies of Shiva, and will perform a Light and Sound Ceremony to absorb negative karma. You will receive the sacred grey ash powder from the homa, which will be blessed in the ceremonies. Keep this on your meditation altar and wear it on your forehead during meditation or at other times to expand the Divine blessings into your life. Participate in the elite ceremonies for Pradosham. Pradosham time is the window of opportunity when you can seek the blessings of Shiva to remove the karma or karmic energies that limit your potential in this current life. As per ancient scriptures, invoking the energies of Shiva through a Hydration Ceremony and a Light and Sound Ceremony, along with a Fire Lab, will help you connect with Shiva, who absorbs negativities to expand possibilities for growth and abundance. Mantras connect people with the spiritual forces associated with planets and celestial beings. The quantum sound frequency THIRU NEELA KANTAM invokes the energies of Shiva, in the form of a blue light. The mantra literally means “Blue-throated One,” referring to the legend of Shiva drinking the poison that was going to ruin the nectar of immortality, and in the process his throat became blue. This mantra invokes the energies of Shiva in the form of a blue light, which removes karma and repetitive negative patterns.